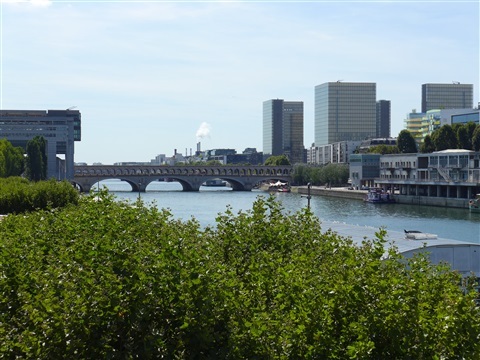 We will start from Port de la Râpée, by the Seine riverside at the foot of the Austerlitz viaduct. (The easiest way is to arrive at Gare de Lyon metro- RER station and to reach the Seine via boulevard de Diderot and rue Traversière). 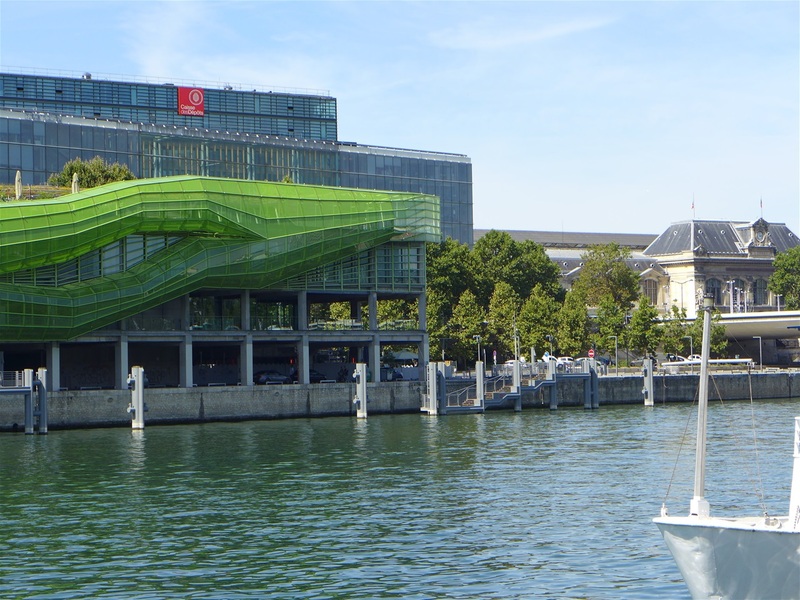 We will walk along the riverside up to the ministry of Finance with its modern building extending far above the quay. As shown with the discovery in Bercy of ten pirogues dating to the 4th millennium BC, the river has always played an important part in this area. In the past, at the intersection of Boulevard de Bercy, Quai de la Râpée and de Bercy, there was the barrier of la Râpée from which the tax collectors were watching the boats on the river. 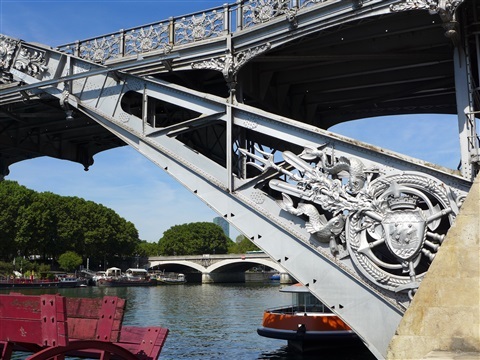 A boat, called Patache, was collecting the duties upon goods entering Paris, by water. 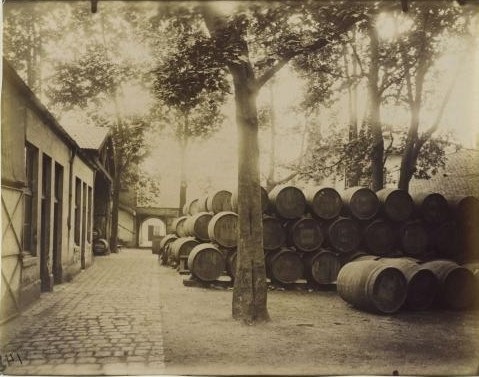 To avoid paying the duties, the wine arriving by water from Burgundy and Loire was unloaded at quay de Bercy, just before the barrier. 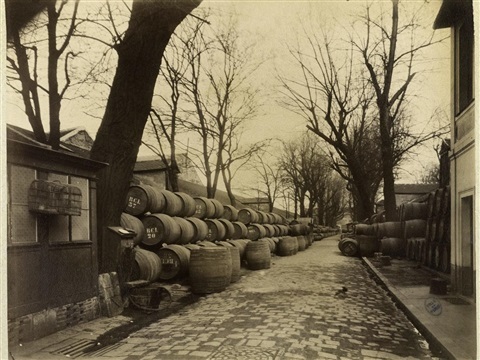 Then, the wine trade developed further, wine warehouses gradually expanded over an old domain and finally grew up to cover 104 acres between quay de Bercy, boulevard and rue de Bercy, and boulevard Poniatowski. 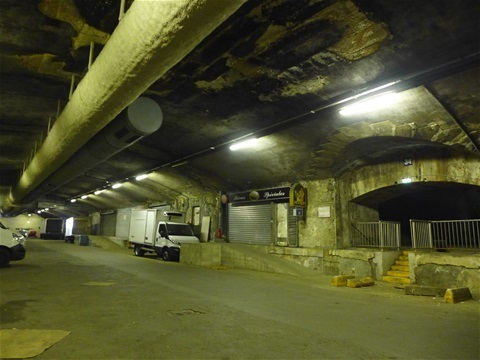 This tour following Atget's steps will be largely a ghost walk: the port activities of quay de la Râpée are all gone, the docks are engulfed within the bitumen of the expressway. But, in good weather, the walk along the old ports de la Râpée and de Bercy is pretty nice with the boat-restaurants offering nice terraces and the view upon new buildings of the left bank showing a modern side of Paris. 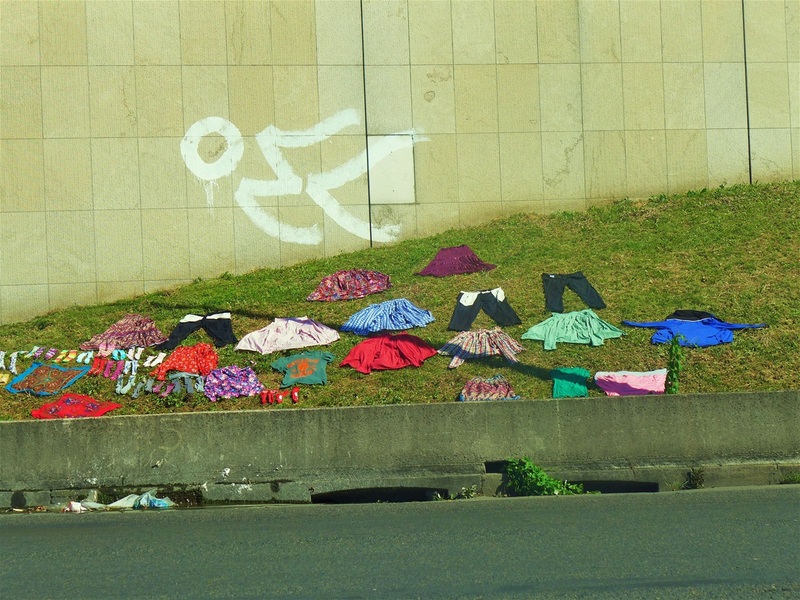 Then, we will walk in the Parc de Bercy. 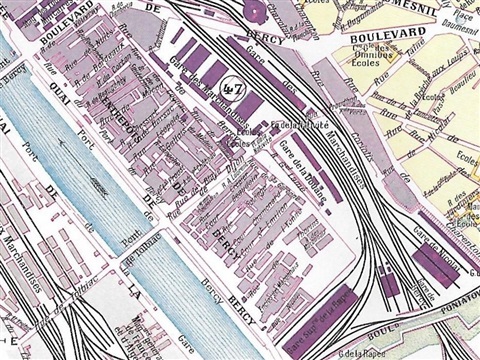 Because ways of wine storage changed, the wine warehouses have disappeared, all gone within the grass of the Palais Omnisports and of Parc de Bercy. Especially in its second and third parts, the park is really nice with its gardens, vineyards and ponds. Within Cour Saint-Emilion, the old chais have been kept like on the other side of the street, the Lheureux buildings which house a fun-fair museum and a school of Bakery and Patisserie. Bercy district is being continuously impacted by changes, including spots that you could have thought to be protected; like the Tunnel des Artisans, rue Baron-le-Roy, used by producers and craftsmen since 1840, enjoying the constant temperature provided by the tunnel. 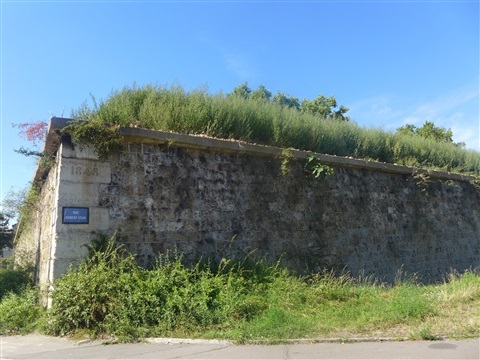 Unfortunately, this natural refrigerator, the only last one in Paris, could be destroyed with the project Bercy Charenton covering 156 acres. As the bastion nr 1 of the fortifications of Paris (1841-1845), listed as historical monument is being converted into a homeless shelter; This by means of a curious reversal, recalling the marginalized populations living outside upon the fortifications like the rag pickers photographed by Atget. The old docks now have been replaced by the express way. 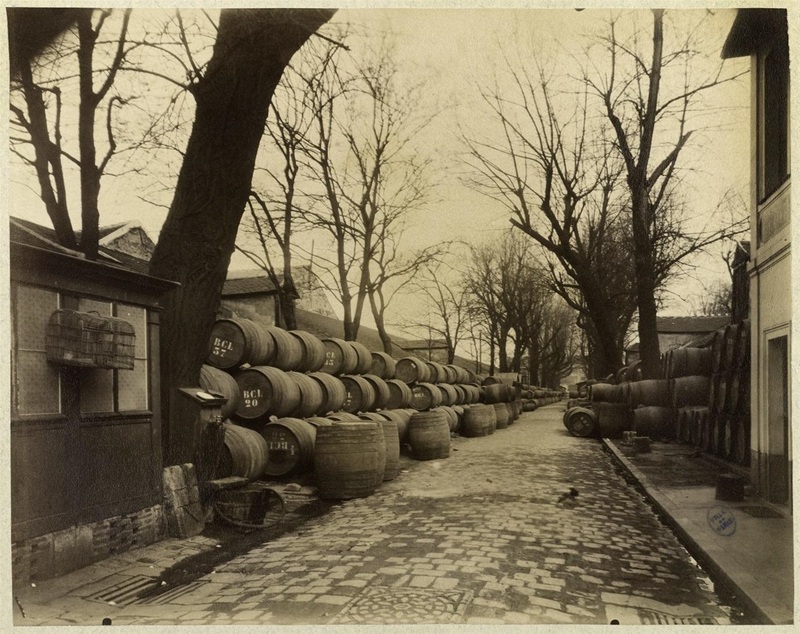 At the end of the 19th century, there was much traffic on the Seine and the Parisian ports were very active: all sorts of material were unloaded: wine at the port of Bercy, wood, stone and sand at the port of Henry IV, coal at la Râpée as shown by Atge'ts photo. 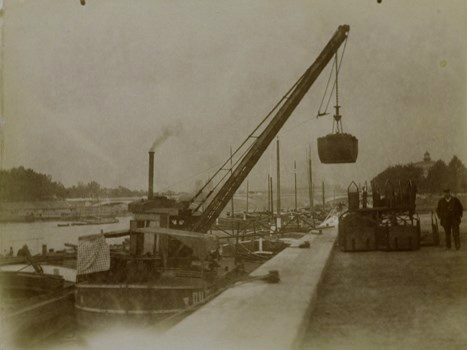 Today when you walk along quai de la Râpée, nothing can recall the coal unloaded in the past, on the contrary there are only restaurants boats with comfortable terraces and lounges, like this boat port de la Râpée standing where was the crane in the past, and available for entertainment. 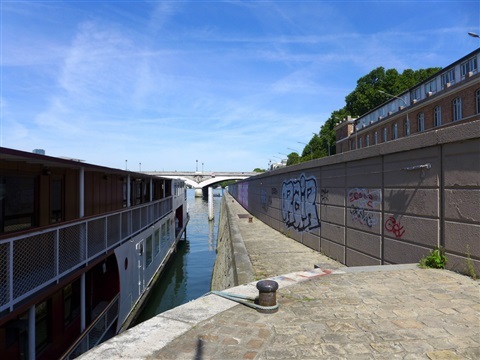 Quai de la Râpée reminds me the first days when I was working at IBM at the seventh floor of the building Rives de Seine, close to Gare de Lyon. I was living rue de Tolbiac in the 13th district and I was using the metro line n° 5, to come to work; I remember the curve followed by the metro train when reaching the area around the forensic institute. 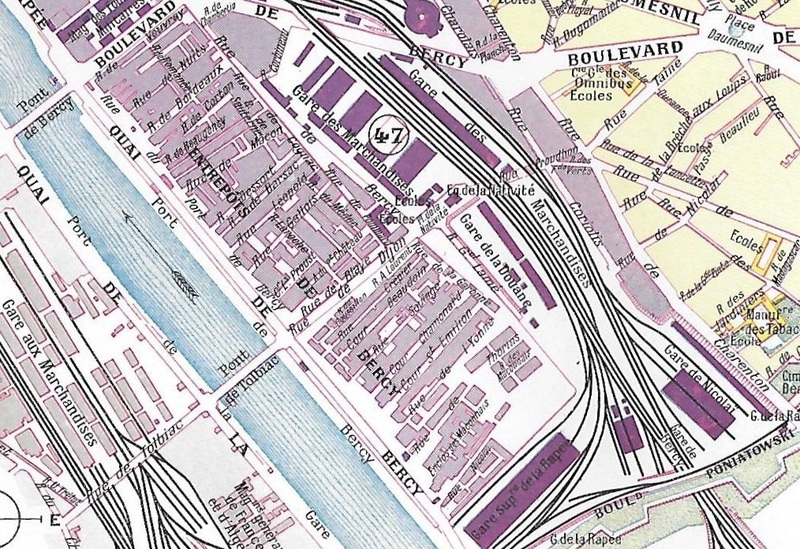 The district all around Gare de Lyon has changed a lot and is still changing, but this part at the foot of the Austerlitz viaduct is the same as described by Leo Mallet in his book, written in the 50s: Fog over Tolbiac Bridge. Fog over Tolibiac Bridge is part of what Leo Malet called his "New Mysteries of Paris," each set in one of the city's districts, or arrondissements, the series referring to Eugène Sue's nineteenth-century Mysteries of Paris. 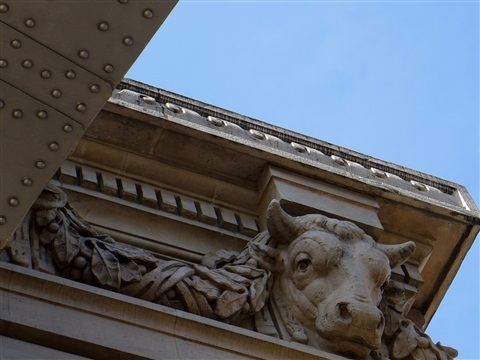 Let's continue walking on Port de la Râpée and Port de Bercy up to the Finance Ministry building hanging over the Bercy Bridge. 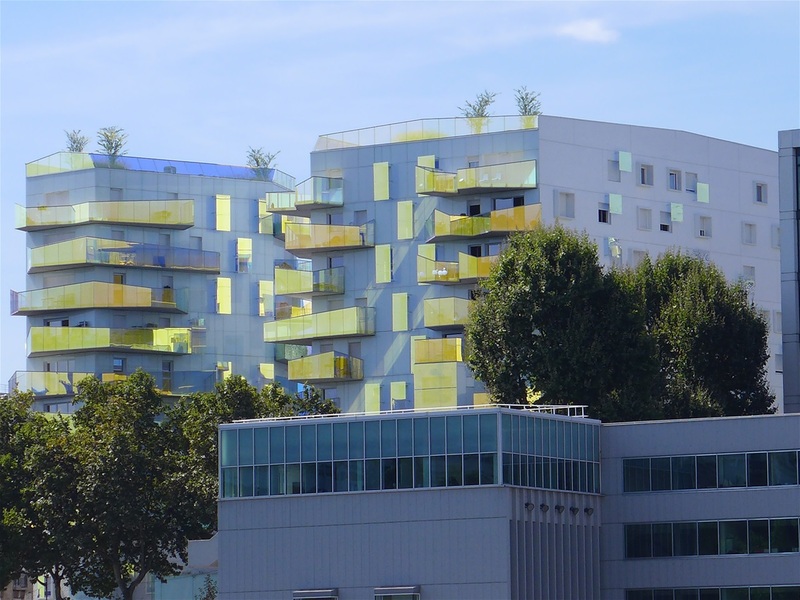 On the other riverside, we can see modern buildings: Cité de la Mode et du Design with its bright green structure, the Fulton building with balconies from blue to yellow through the green, depending on the angle of view (dichroic glass), BnF (National Library of France) designed by Dominique Perrault like four big open books facing each other. Let's walk between the Finance Ministry and the Palais Omnisports de Bercy walled with a sloping lawn. 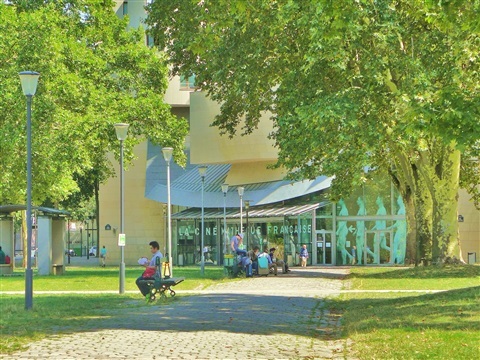 Let's go around this pyramidal building and go into the Parc de Bercy. ( meaning wine merchant) recalls also the old activity of the wine warehouses in Bercy: this time, the sauce is made with a full-body red wine. 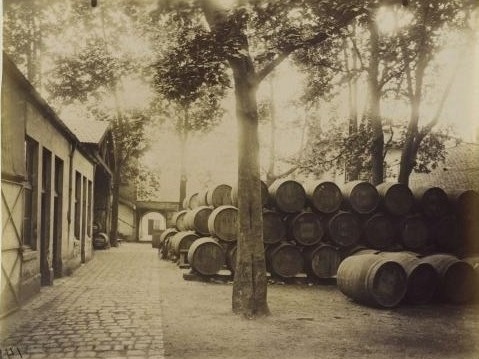 Still today, streets names around the park recall the wine activity, like: rue de Pommard, passage Saint-Emilion, rue de Chablis. 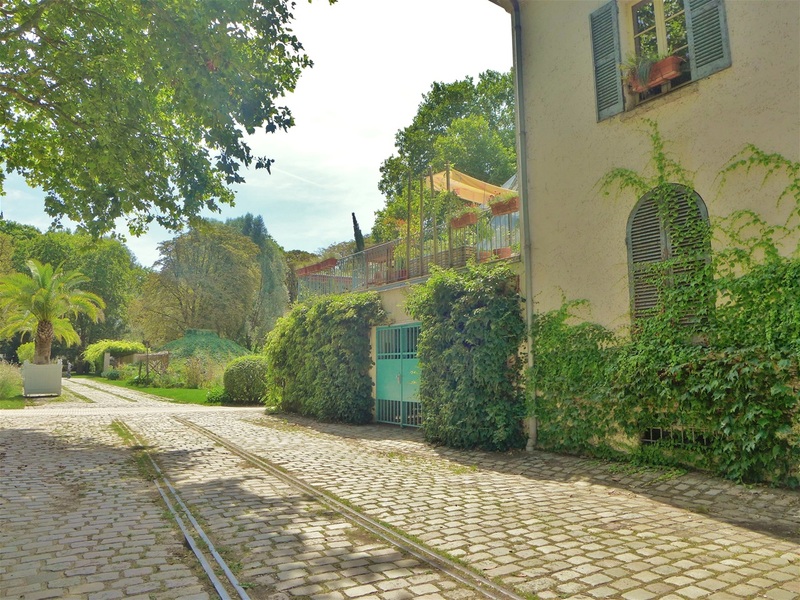 But, instead of the wine warehouses and cellars, there is only a park, called “jardin de mémoire” (garden of memory). Divided into three different parts, the park is structured following the lay-out of the old lanes, which were all named from a wine area. On the ground, you can still see old rail lines used to carry the wine casks. 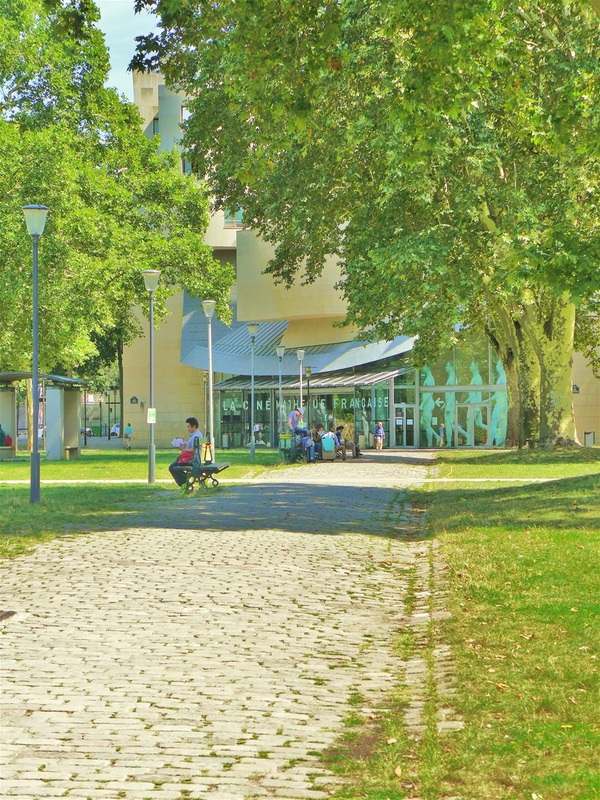 Around you, you can enjoy the shade of the preserved hundred century-old plane trees and of a thousand new trees. 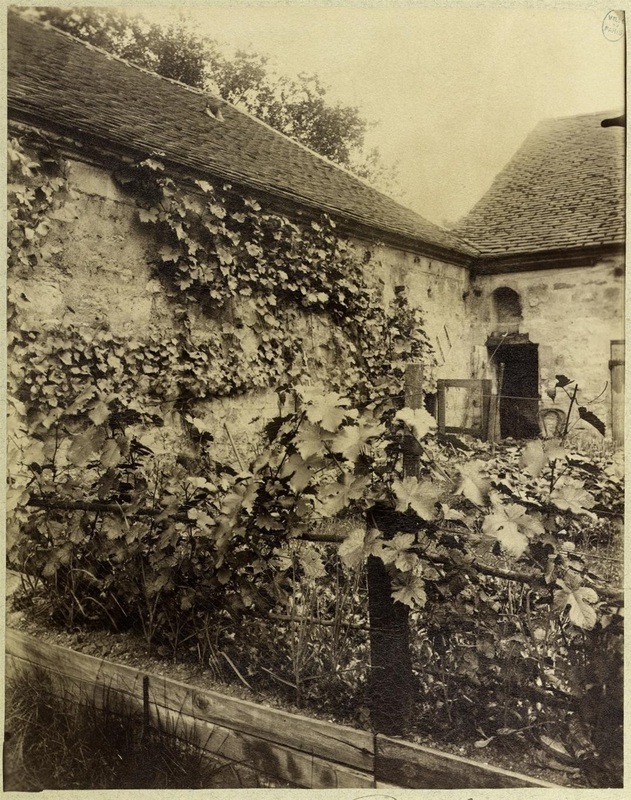 To complete the memory, four-hundred vines are harvested each year. 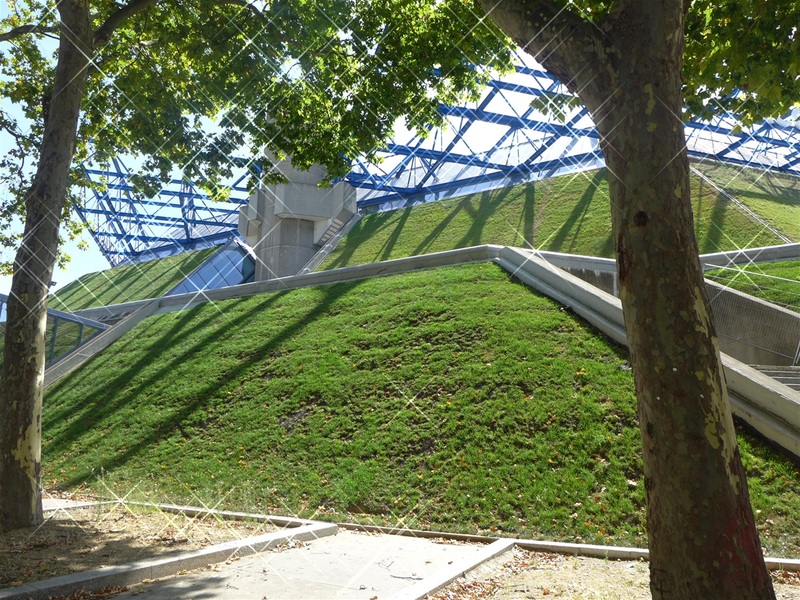 The first garden in front of the Palais Omnisports is the least attractive. 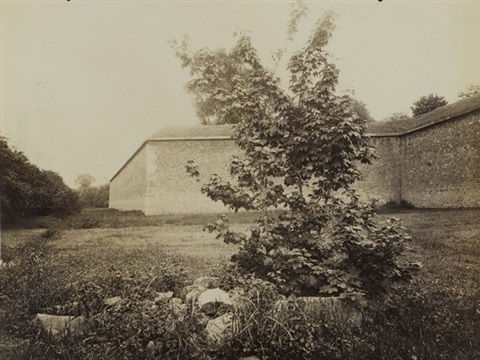 Called “les grandes pelouses” (the vast lawn) is just at best a large meadow or the worst a straw mat; more or less well maintained, the square lawns are divided per the grid pattern of the old lanes. Cour Dessort, photographed by Atget, was roughly between today passerelle Simone de Beauvoir and Cinematheque Francaise, located in a building designed by Franck Gehry (initially for the American Center). 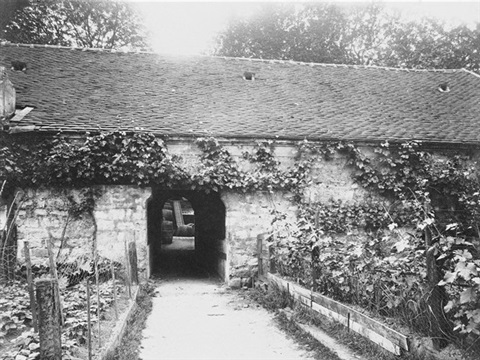 Originally, Cour Dessort opened in 1878 was between rue du Port de Bercy and rue de Cognac. 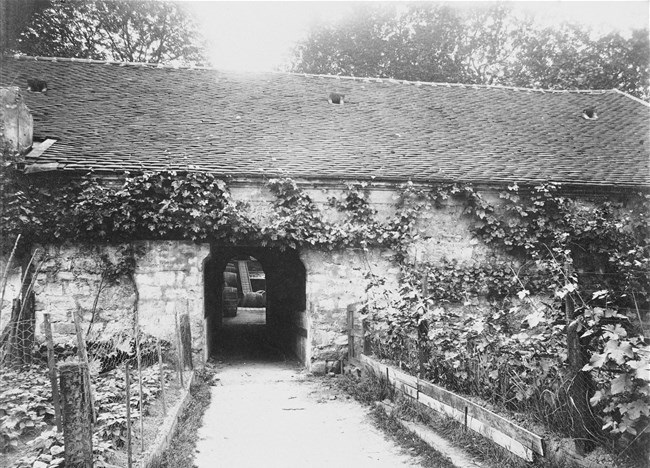 Dessort was the name of an owner of a wine warehouse. 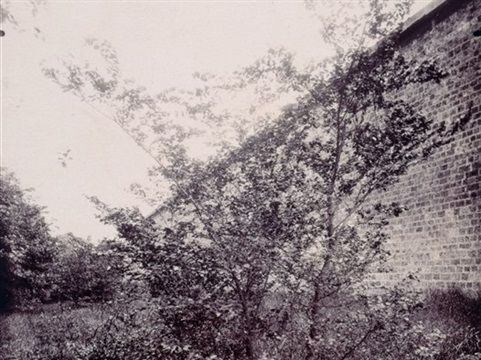 The central bucolic part is arranged around nine gardens with, in its center, the house of gardening. The vines, protected against the greedy blackbirds, recall the old activity of the area. 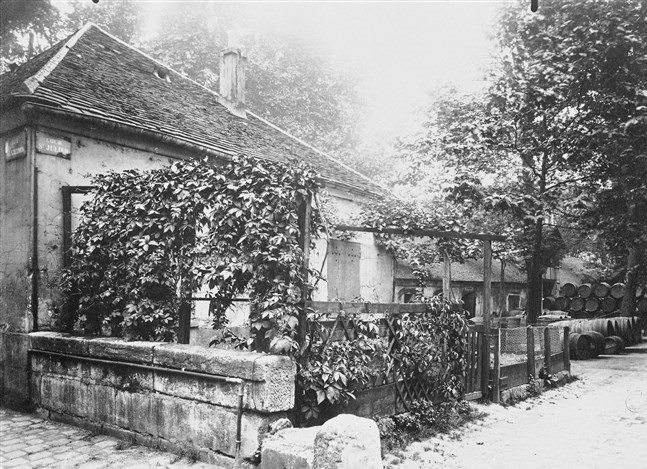 Today rue Laroche, photographed by Atget, is roughly in the axis of one of the footbridges above rue Joseph Kessel. Initially, the lane located between rue Leopold and rue de Blaye was opened in 1815 by a wine merchant from Laroche Saint Cydroine, a city in Yonne department. Located in the third area of the Park, le jardin romantique or Romantic Garden is arranged around ponds with ducks and turtles. 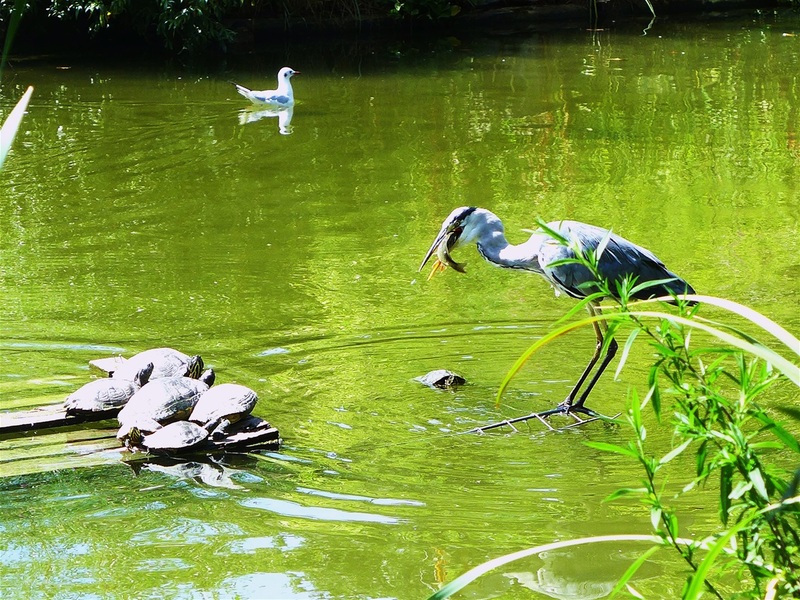 I was lucky enough to even see a heron capturing a fish, not that common to see in Paris! 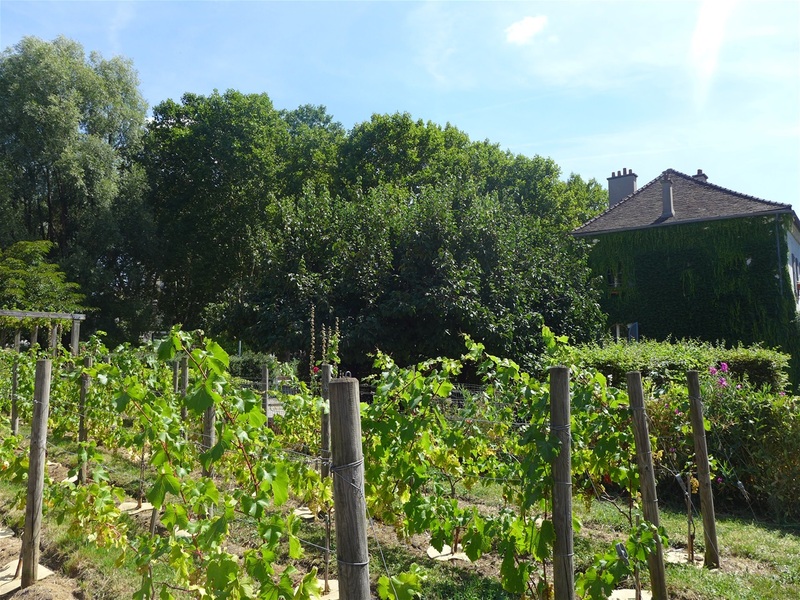 From this garden, we get into Bercy Village where the old Saint-Emilion wine warehouses have been converted into boutique shops and restaurants. 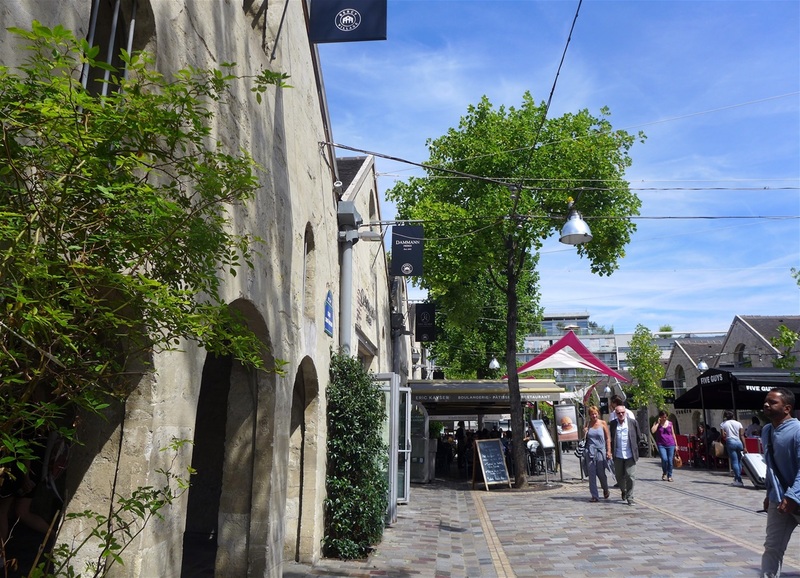 Through Passage Saint-Emilion, we reach rue des Pirogues de Bercy which name recalls the discovery in Bercy of pirogues from the neolithic period which can be seen in the Carnavalet museum. 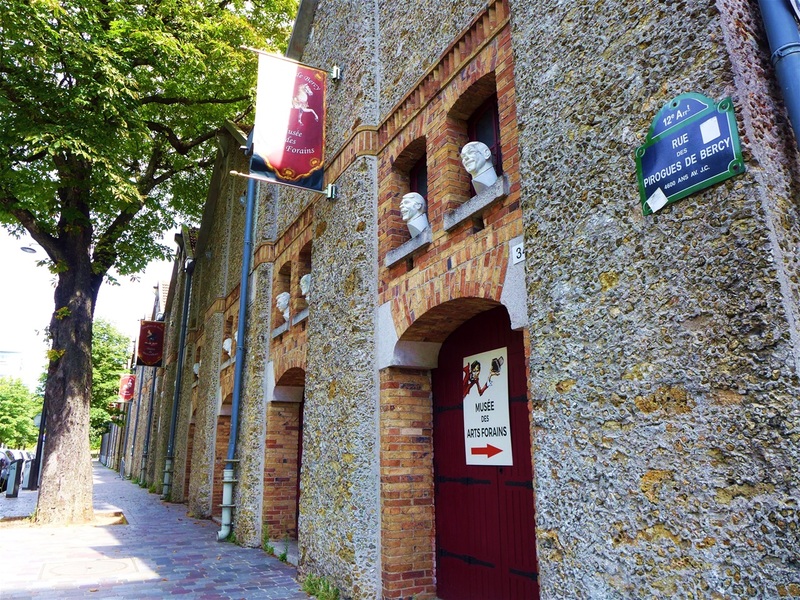 In this street, you can see other old wine warehouses nicely restored, the Chais Lheureux housing now a fairground museum (Musée des Arts Forains) and a school of bakery and Patisserie. We can stop here. 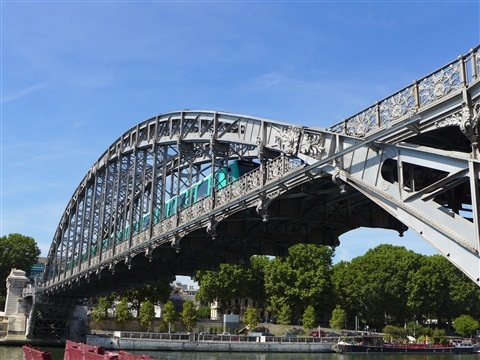 Either you can use either the bus line 24, rue des Terroirs de France, that will take you in a pleasant drive through Paris, or metro at station Cour Saint-Emilion. 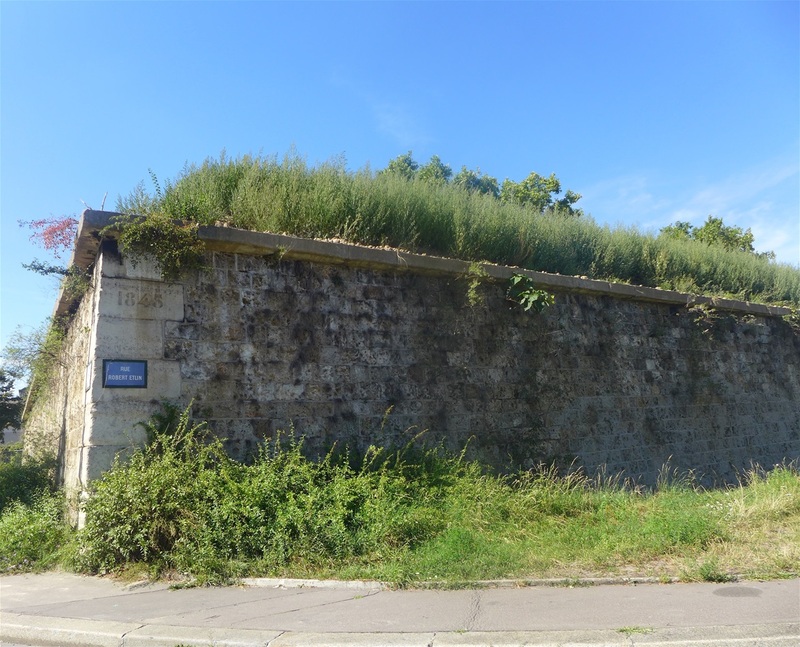 After the Tunnel des Artisans, I wanted to see at which point was standing an other project impacting the Bastion nr 1, part of the old fortifications of Paris, with the construction of a shelter for the homeless. 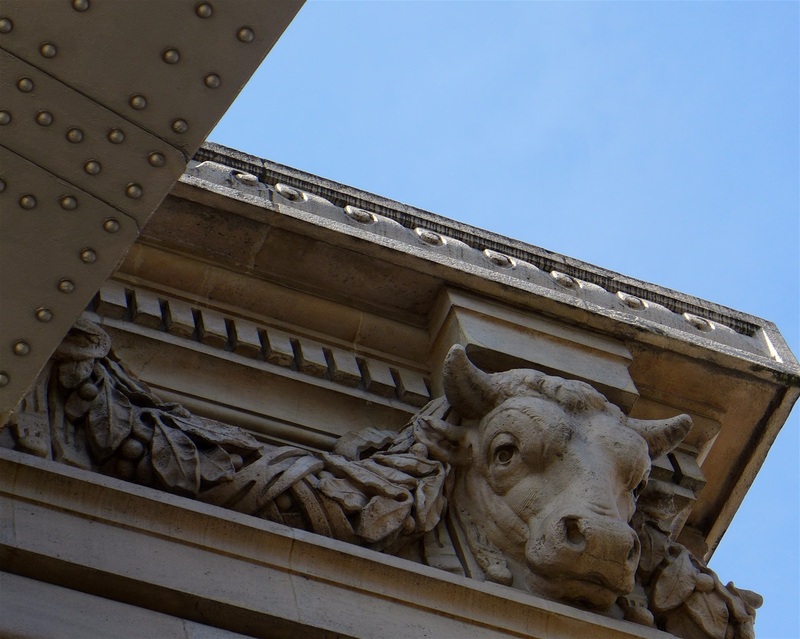 Since the bus line 24 was not stopping at rue Robert Etlin, closed with the building works, I had to use a lane for pedestrians between rue Baron le Roy and boulevard Poniatowski. 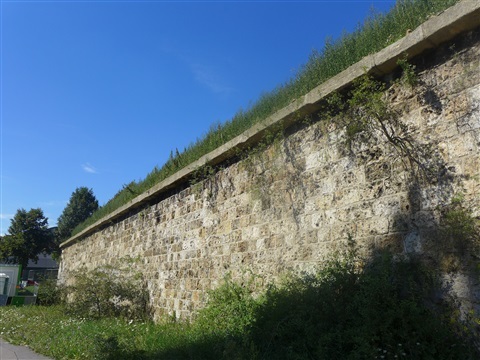 Today, bastion 1, listed as historic monument, remains the only one significant element of the old fortifications (last defensive walls built between 1841 and 1844). These remaining walls around a small polygon, 100 meters long, were the only ones to be saved, obviously too much small to be pulled down and replaced by social housing like most of the fortifications around Paris when they were destroyed in 1919. Obviously, today, enough large to receive a shelter for the homeless. Standing between a large rail junction and storage warehouses, the area is not made for strolling; the air we breathe is full of the pollution coming from the close peripherique motorway and the huge Bercy interchange. 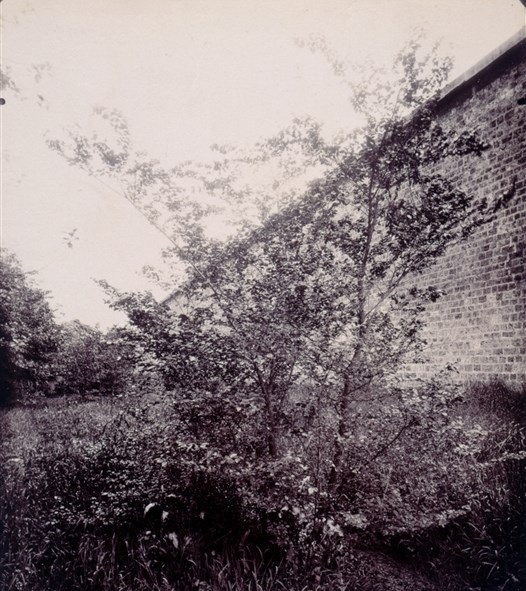 Only the obsession I have in following Atget’s steps and the curiosity I have to discover unknown places were strong enough to come to this part of Paris.